Papell with Love: PPP - November Product Release Blog Hop! Hello Everyone, Joni here. I can finally share on this Blog again after a long discussion with Blogger. I am sharing my take on the new release from Pretty Pink Posh, using the new Penguin Pals stamp set and Penguin Pals Coordinating Dies. For this project I also used the new Happy Holiday Script Dies. To begin I first stamp the penguins on a white cardstock and colored it with Copic Markers. Then die-cut. I also used the new Pine Sprig Dies, after die-cutting I then colored the sprigs with Copic Markers. 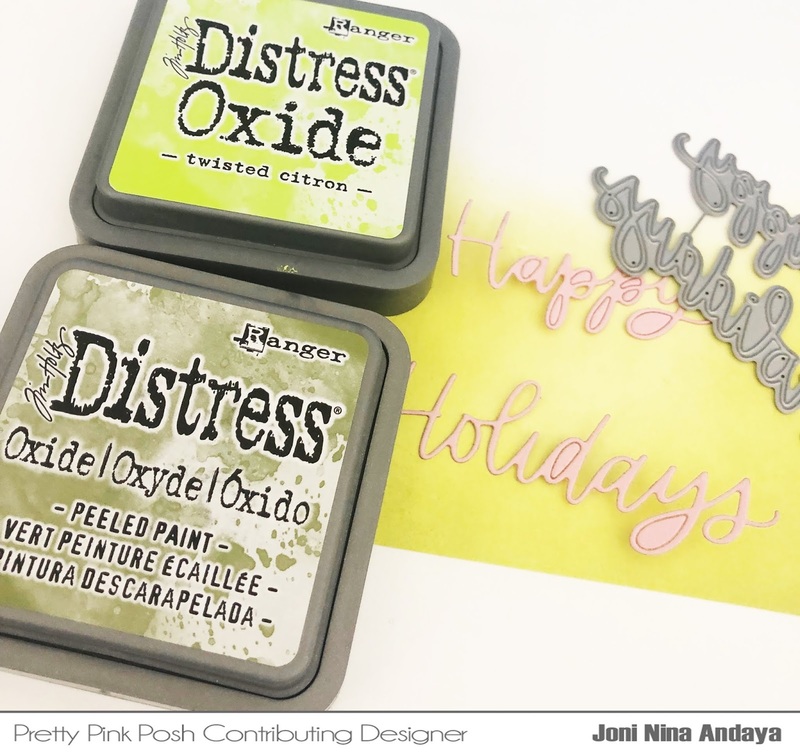 For the background of my card, I used the new Distress Oxides in Twisted Citron or Peeled Paint. Then, adhered die-cut "happy holiday" on the card. Just another look of the finished card. Thank you for stopping by! Your next stop to Gemma's Blog. Your penguins loik so cozy and cute! What a cute little pair! Great colors! Beautiful card. Love the background, would never have thought to use twisted citron and peeled. TFS. WOW! you are so amazing - cute, cute, cute! Joni, I love the colors in this background. Really makes those penguins pop. So much greatness in this release. My favorite is the decorative ornaments. Those penguins are just too adorable and the hats?!?! Perfection! Okay.....your card is pretty dang cute and I love the subtleness of the shading & such! How pretty! This card is adorable; those little penguins are just so sweet! This is so cute! I love the background too. This is so cute, I love how it turned out! Thanks for sharing! Love the colors you picked and those penguins!!! It's a very cute card ! Great job ! Thanks for sharing ! Your card made me smile, it is the sweetest! Sprigs and penguins sure made for a wonderful looking card. Great release. I love the penguin hats and the many ways this stamp set can be used. Super hop and darling card. Very cute. I'm having a problem with Blogger, too. Looks like I'll have to comment under name/URL. Ugh! This is adorable Joni! Love your coloring on those little penguins! Your card is so cute! Love these penguins! Fabulous card! Love the yellow background is fun with those penguins!! AWWWWWWW what cutie pututi penguins on your card! I really love how you colored them! Absolutely adorable! I love your coloring on the penguins - their hats are so cute. Such a happy card! Love your penguins! Very cute! I adore penguins,its like they are holding hands with a little hug. Lovely card using the sprigs and berries too. Thanks for sharing. Sweet card with these adorable penguins! Love your pretty coloring! Wonderful colour on a wonderful card. Thanks for the inspiration! Love the coloring on your penguins and how you combined it with the pine sprigs. So cute!! Super adorable penguin pals, love the ink blended background, so cheerful and festive. Such fun! Love these guys! Cute penguins and I like the greenery. Wonderfully adorable and festive card! Beautiful composition, blending and coloring. Such a fun card and love the non traditional colored background! Aw! Those penguins are so sweet! I love the card! Very pretty. The yellow adds such a nice brightness. Well done! Cute card. 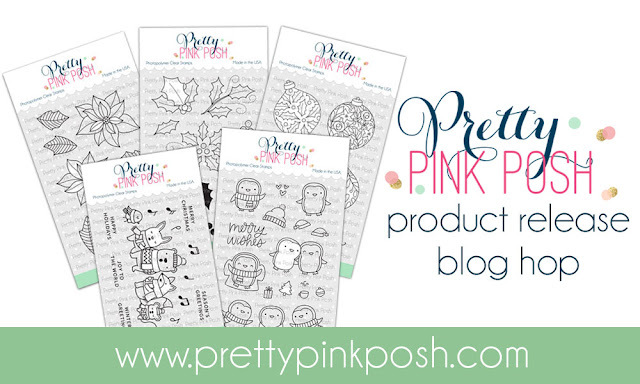 The Pretty Pink Posh Penguine Pal stamps are darling. I can't wait t to get my hands on this set and everything else in this release. Thanks for sharing. Ooo, the warm tones on these penguins are fabulous. I love your shading and the different look you gave these adorable little critters. Thanks for sharing with us! Love this card, it is so cute! How cute! Love your coloring on those adorable penguins! Such cuties...love the background you inked up too. Fun card! Love the pine sprig!